I compiled this information from available sources and would appreciate any corrections or additions. The first newspaper in Jones county was the Anamosa News published in February, 1852, William Haddock, editor. The editorship was taken over by Mr. Brooks in 1855, and the name changed to Anamosa Bulletin. In 1856, Joseph Mann and Ralph Sawyer became editors and again changed the name. This time to Anamosa Gazette. In 1858, Mr. Hayes took charge, conducting it until October of that year, when it collapsed. The newspaper was revived in 1861, but survived only three months. The Gazette is listed in the 1860 Iowa State Almanac and Statistical Register, transcribed for Iowa Old Press by Sharyl Ferrall, as a Democrat paper with Hayes as editor. The Anamosa Eureka was established by C. L. D. Crockwell and John E. Lovejoy, in August, 1856. The following year Crockwell and Matt Parrott were the editors; April, 1858, Edmund Booth, one of Jones County's most notable citizens, and Parrott; December 11, 1862, Edmund Booth became sole editor, but was shortly was joined by his son, Thomas, editing and operating the paper until his retirement in 1895. A highly respected newspaperman, Booth was instrumental in inducing the Iowa legislature to provide for sending deaf children to the Illinois School for the Deaf, and later, to establish the Iowa State School for the Deaf in Council Bluffs. In 1880, he helped to found the National Association of the Deaf, at a meeting in Cincinnati of representative deaf persons from all over the United States. Also in 1880, Booth received an honorary Master of Arts degree from the National Deaf-Mute College (now Gallaudet College) in Washington, D.C., in recognition of his attainments as a scholar and journalist. Edmund W. Booth died March 29, 1905 in Anamosa, Iowa. Matt Parrott deserves additional mention. In 1869, he went to Waterloo and, in company with J. J. Smart, purchased the Waterloo Reporter and printing establishment. Mr. Parrott, with his sons, converted the Reporter into a daily paper became the sole owners. In 1879, he secured the office of State Binder which he held for three terms. He was elected to the State Senate in 1885, and served two terms. In 1895, he was elected Lieutenant-Governor and reelected in 1897. He was twice a candidate before Republican State Conventions for Governor but was defeated. He was at one time President of the State Press Association, and was a life-long Republican. Gardner & Bye were the editors in 1911. The paper was designated Republican in the Iowa Official Register. The newspaper is still published and you can visit their website. The Anamosa Journal was established in 1872 by C. H. Monger. He continued as editor until sometime after 1893. In 1911, The Anamosa Journal was listed as a Democratic weekly issued on Thursdays. E. R. Moore editor. The Eureka and the Journal were published separately until 1979, when they were merged. In 2004, the Anamosa Eureka-Journal won first place for weekly newspapers in its circulation class from the Iowa Newspaper Association. Website. The Anamosa Reformatory Press is listed in the 1911 survey as a weekly with Felix H. Pickworth as Inst. The Monticello Express was started by O. D. Crane, July 10, 1865. Over the next 10 years it was edited by James Davidson, Messrs. Scott & Howard, J. H. Scott, G. W. Hunt, and in 1875 was under the editorial management of John Blanchard. In 1893, J. W. Doxsee was editor. The newspaper is still published and you can visit their website. According to A.T. Andreas Illustrated Atlas of the State of Iowa, "The Jones County Liberal was established by George W. Hunt, September 19, 1872, and is still flourishing." The paper was actually established in Montecello by Gilbert Watson Hunt, a young newspaperman from Maquoketa. Another source gives the date as 1871. Hunt was the husband of Harriet Earle Hunt, an Iowa newspaperwoman of some note. The Hunts left the county in 1880. The paper was still being published in 1884, but was eventually combined with or renamed The Jones County Democrat. The Monticello Times, L. T. Alexander, editor, was listed in the 1893 Jones County Plat Map book. 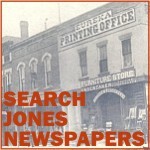 The Jones County Times was a weekly Democrat paper edited by J. T. Lanigan and listed in the 1911 survey. The Die Freie Presse was a German language weekly newspaper of news and politics published in Monticello 1879-1880. The Olin Recorder was established in 1880. In 1893, A. J. Burke is listed as editor of "The Record" in the Plat Map book. It is listed in the 1911 survey as republican with A. A. Cole as editor. The Olin Times was established by Messrs. Stickle & Arien, August 1874, and was discontinued by 1875 or 1876. The Oxford Mirror was published in Oxford Jct., IA from 1879 to 1953. From 1898-??? ?, it contained an insert named Lost Nation Chronicle. In 1893, Charles A. Seaton was editor. It is listed in 1911, as democrat with Frank Kenney as editor. The Wyoming Journal, started by A. L. Smith, April, 1871, was afterward edited by Reverend E. Skinner, and then by N. W. Woodford. Andreas lists it as "defunct" in 1875, but also lists it as "published under the editorship of P. D. Swigart." It is listed in the Government Printing Office survey of 1884, and in the State Printing Office survey of 191l, as Republican with D. A. White as editor. The Wyoming News was established by Messrs. Hunt & Howard, November 19, 1873, and was discontinued by 1875. Barney Hicks of Bowens Prairie married Lizzie Ralston of Clay Mills on 11/16/1873. William A. Nims married Martha Smith, both of Wyoming, on 11/17/1873, at the residence of James A. Bronson. Rev. H. H. Green presiding. Milton T. Blazer of Scotch Grove married Fannie A. Hart of Wyoming on 12/19/ 1873. They were married by Rev. John Rice. J. C. Dietz opened and read the will of Arthur Hamilton. Cora L. Nichols was laid to rest in the Wyoming Cem. She died 12/23/1873 of quick consumption. She was 21 years, 3 months, 20 days old and the wife of John C. Nichols. Her parents were Daniel E. & Angeline C. (Seaman) Brainard. Linettie "Nettie" Palmer died 11/28/ 1873 at 18 years of age. She was born in Rhode Island and was the only child of John and Harriet Palmer. Her bridal robes were in waiting. She lies in Clay Cemetery. November 10th, 1873, Sarah E. McClure died at the home of her son, William, in Wyoming, Iowa, at age 86 yrs. She was from Bath, Steuben Co., NY, and the widow of General George McClure. She also is buried in Wyoming cemetery. The best news of all: No drunken men or fights seen on the street during the whole week of Thanksgiving day & evening. Not any whiskey sold here for any purpose whatever, neither drug stores or saloons. This speaks well of city government.